We decided a year ago, after planting a small, educational vineyard (i.e., seven vines, planted for the sole purpose of getting some hands-on experience with viticulture) to forego the use of grow tubes. That was a tough choice. Almost every vineyard we’ve visited nurtures young vines in grow tubes, and there’s probably good reason to use them in large commercial undertakings. But we decided against them for our small hobby vineyard for reasons that we think make sense. Most of the research we’ve looked at suggests that vines raised without grow tubes do better in the long run than those that spend their formative months inside protective shelters. We happened to speak to a vintner from South Africa over the weekend, and he echoed our views, noting that he had not even seen a grow tube before arriving in the United States. He still believes, he said, that the vines are better off without them. But, of course, everything comes with a price. And this weekend, we got a real taste of the price you pay for growing vines without protective shelters. The main reason vineyards love grow tubes is because it makes cultivation easy. You can spray herbicides such as Round Up around the vine to kill off the weeds without having to worry that your Cab Franc will die with them. Okay, I know that’s not a controversy-free statement. Advocates of organic wine, natural wine, biodynamic farming and so on will object right off the bat to the use of herbicides, however easy they make the task of maintaining a vineyard. And my heart is mostly with them, for a variety of reasons I’ll explore in future posts. But the fact is, keeping the weeds down without Round Up can be just plain drudgery. Trust me, I have the aching muscles to prove it. Now, it’s true that our vineyard is small. Right now we have only 150 vines, and the space they take up wouldn’t fill a small corner of even the smallest of the Commonwealth’s commercial vineyards. So we thought we could afford a few luxuries when it came to maintaining the vineyard. But it turns out that pulling weeds by hand is work – really, really, really hard work. We started off a few weeks ago with nothing more than a hoe and our own hands. And by “we,” I mean my wife, the Vineyard Goddess, as I was still recovering from surgery on my cervical spine (Level 4 ACDF for those of you who know or care about these things). I was there in spirit, but it was the Vineyard Goddess who was working the soil with a hoe, and then kneeling down to pull the weeds by hand. I wasn’t actually there, but I have no doubt that it was slow, painful work. And I know that, because we talked about it. I might have been unable to do physical labor, but I was still available as a consultant, and it occurred to me that there might be mechanical devices to help with this chore. Sure enough, there are. My preference would have been a small, gas-powered cultivator, but with our very steep slopes, we were concerned that we wouldn’t be able to control it well enough to avoid damage to the vines. So we went with a battery-powered cultivator, and ordered an extra battery with it. How well did it work? Let me start with the cons. The battery life was way less than we expected. I didn’t actually time it, but there were days when it seemed like we were getting no more than 15 minutes from a single batter, and I’m probably being generous. The batteries take a good six hours to charge, so this isn’t a small issue. (And walking up the hill from the vineyard to our house is no small issue either.) Because of the limited battery life, I (yes, me; by last week, I was back in action) decided to cultivate the area immediately around each vine, rather than all of the space within the row, trying to give myself a radius of 12 inches that would allow us to put fertilizer down. I was able to get maybe 18 vines, and probably less than that, off one battery. Petit Manseng vines, looking strong and healthy despite the heat. And lined up in a weed free row. However, I have to say, it did a great job before the battery died. In the ten to 15 minutes I spent cultivating, I was able to turn the soil to the point where it was almost effortless to pull the weeds out. In fact, some just pulled out with the cultivator. And it’s so much nicer to do the job standing up than kneeling in front of the vine. Sure, eventually you have to get down close to the ground and pull most of the weeds by hand, but it’s much easier after you’ve chewed through the soil with the mechanical cultivator. So, we managed over the course of four days to finish the job of cleaning out the rows. And, oh, my God, was it ever hot this past week. If you haven’t spent a couple of hours working in a vineyard when the temperature has cleared 100 with a few degrees to spare, you just haven’t lived. Was it worth it? Doing the labor by hand (yes, with the help of an electric cultivator)? Yeah, I think it was. I believe our vines will do better without grow tubes, and I think the little ecosystem that surrounds and includes our vineyard will be so much better off without herbicides. I’m not saying that to be critical of vineyards that use Round Up to control weeds. We have the luxury of managing a very tiny vineyard and we can do some things by hand that would be impossible for a vineyard that measures its size in acres. Oh, and of course, the experience of cultivating by hand gave us the added benefits of sunburn, heat exhaustion, physical exhaustion and just plain sore muscles from bending and lifting in every conceivable direction. Could life be any better? Thanks for the note, Bob. I’ve also wondered whether I could use some kind of mulch — old carpets, grass clippings, whatever — to keep the weeds down, and I truly don’t know why they wouldn’t work, assuming the vines still get water and the material doesn’t add any chemicals to the soil that might hurt the vines. Please let me know how it goes — i may follow your lead if it works! BTW, what varieties of grapes did you plant? Amd where is your vineyard? Bob, we have always used grow tubes for the reason that you have identified. It allows you to spray herbicide without affecting the vines. Our vines have not suffered as a result of this and usually bear 1 to 2 tons per acre of fruit in their 2nd year. This year we planted just under 3 thousand Sauvignon Blanc and did not find time to put on the grow tubes. They are all doing fine but will struggle to meet the cordon this year and unlikely to fruit next year. We have used Poast as a herbicide for the grass. 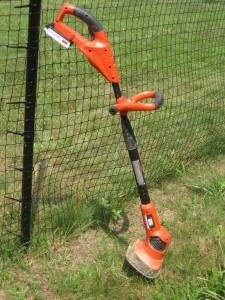 It does not affect the vines and then allows you to quickly remove the broad leaved weeds with a hoe or spade. It has worked well with the minimum of effort. Bill, thanks so much for taking time out to comment. Our property is near Veritas, so we have been keeping a close eye on your vines! Do you think the Sauvignon Blanc would be doing better with grow tubes? It’s pretty impressive that you’re able to bring in so large a harvest of grapes in the second year. I’ve just assumed we’d have to wait three years before we got fruit. BTW, we were at Veritas last Thursday. I really like the 2011 Sauvignon Blanc and the new vintage of “3.” We still have three bottle of the 2009 “3” in our cellar, and I’m thinking it would be a good time to open one and see how it’s aging! Thanks for the tip on Poast. 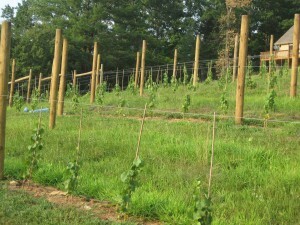 My vineyard is here in Zionsville PA, between Allentown, and Philly. I’ve planted 20 Chambourcin, 10 De Chaunac, 10 Chelois, and 10 Chancellor. Small to start with but I’m a 1 man operation for now. I’ll let you know how the carpet works out. Thanks again for the blog. Bob, one other thought. I’m not sure what kinds of chemicals were used in the manufacture of the carpet, or how they might affect the vines if they leach into the soil. Just something to consider. We also have always used grow tubes as standard practice for first and second leaf vines to facilitate weed control. It has been my experience that a generous weed free zone is essential for these young vines as they establish their root systems, particularly when dry farming as we d0. Competition for available water and nutrients from weeds can really stunt the vines in the first year which usually translates into slower than desired development in the second year as well. In a commercial setting (we have 27 acres of vines) we have to try to avoid anything that delays the vines capacity to ripen fruit. That being said, I don’t like grow tubes. The only benefit I can find is the ability to apply herbicides and keep the weeds under control without cultivating. Erosion is already a concern just by the very nature of keeping a weed free strip so I prefer not to disturb the soil there any more than necessary. The list of cons is a bit longer. My preference is to train up several shoots, particularly the first year, for use as potential trunks. Most commercially available grow tubes I have found are actually for use on trees rather than vines and have too small a diameter to do this. In fact it is not uncommon to only get one strong usable shoot the first season, thus the reason for using the grow tube in the second year as well in order to train up a second trunk. I have also found that once the grow tube is removed, often the leaves that were inside the grow tube die and fall off. 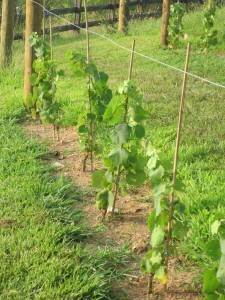 This makes it critical that there are enough developed, healthy leaves above the height of the tube to maintain the vine. If not the vine gets cut back to a couple of buds year two, the grow tube goes on and the whole cycle starts again. Good luck in your efforts, I’d love to be able to find a solution that can be adapted on a commercial scale. Well spoken. I love your posts. I concur in the write up and wish you a good recovery from (yikes) quite a surgery, observe that a battery pack for you and the goddess to get up the hill might also be in order, and would just add that one other purpose of grow tubes – maybe even the biggest purpose – is keeping dem wabbits from eating the leaves of new vines, retarding their establishment. Holy smokes we have had a lot of wabbits this year. Elmer Fudd nighmare. Even so, starting today at my DuCard Vineyards we are taking the tubes off of our second year vines, so that the developing trunks don’t get fried by the ongoing heat of summer (we will strip leaves/shoots on the trunks anyway, to above where any other than Olympic qualifiers will be unable to reach). Big fun.